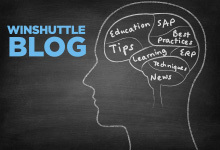 Last month, the annual SAP TechEd event took place in both Berlin and Las Vegas. It’s the conference where we generally expect to get a bit more substance behind announcements made at SAPPHIRE earlier in the year and obtain a better understanding of SAP’s focus and priorities going forward. One of the key themes at this year’s TechEd has been about extending the reach of SAP. The focus on technologies such as ‘Project Gateway’ and Mobility are strong indications that SAP wants to make its data and functionality more accessible by other platforms. For Winshuttle, this is a strong verification of the approach we’ve been facilitating with our products for a long time now. There are no doubts about the robustness of SAP as a transactional backbone. However, in order to truly realize the return on the investment in SAP, organizations need to deploy tools and solutions that enhance the timeliness and accuracy of data entry. And this is where usability and the idea of taking SAP to the people in the environments they are already comfortable in becomes crucial.